Hannah and Ben were fantastic. 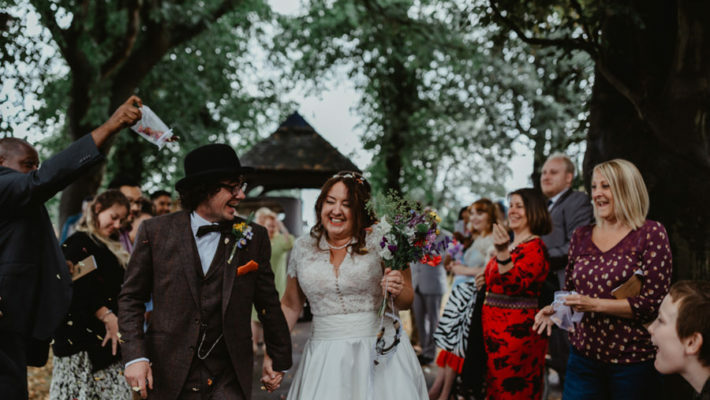 Not only do we have some beautiful photos to cherish, but they also captured the enjoyment and fun moments of our big day. St Peter’s Church, Yoxall, Staffordshire, with a marquee reception at The Bride’s family home in Yoxall, Staffordshire. Captured the glorious weather and the enjoyment of all our friends and families perfectly! We were both working in Queenstown, New Zealand and met during the ski season. Our love of skiing (and each other) grew from there. 15 months, we found ourselves having several productive bursts of wedding planning with lengthy breaks in between to keep our sanity. Always get more than one quote for all the major components, especially catering and honeymoon travel agents. Smaller items such as decorations and furnishings can often be found on the internet or home made for an even better price. We found Jen Simpson on Etsy who was great at customising the wedding invites to match our theme perfectly. Other stationery was designed by the Groom’s cousin Danielle Lunn in Australia. You know when you find your dream dress, you just never want to take it off! Justin Alexander, supplied by Bell’Amore in Bexleyheath, London. Emma wore Jimmy Choo shoes, diamond and pearl earrings by Ungar & Ungar were a wedding gift from the groom, vintage pearl bracelet from an antique jeweller in Bath and during the evening reception wore an antique pearl necklace passed down through the Julian family. Bespoke three piece tweed suit designed and fitted by Barrington Ayre. Dark Teal dresses were by Maids to Measure in Fulham, London. Hair and make were trusted to Isey & Co in Barton under Needwood, Staffordshire. Joan Simms created our beautiful flowers and candelabras. Incorporating English roses and Australian eucalyptus. The acapella choir singing Waltzing Matilda in the church! Songs of Solomon read by close friend Kate Wood. The church was decorated with beautiful flowers and home made pew ends. The marquee’s clear dome roof (unique to Top Marques) provided all day sunshine to light up the venue. Home made raspberry jam was made for favors, and looked great alongside the decorated candelabras and vintage ski postcards for table names. Lots of fairy lights created a romantic atmosphere and worth the time spent climbing up ladders! It was a three tiered cake with fruit, sponge and chocolate layers with gorgeous bespoke ruffled icing and flowers by the Tiny Cake Company in Burton-on-Trent. We also had two yummy macaron towers. Johann Ting played guitar and ukulele in both the wedding ceremony and reception drinks. The live band Indefinitely played in the evening and provided DJ between sets, perfect for dancing! We also had a Marryoke done by Electra Films and Hannah and Ben at HBA Photography provided a fancy dress Fun Cube for guest book photographs. Just relax and enjoy yourself, remember the day is about you and your partner. what a gorgeous wedding day, it looks fabulous!